Trading since 1983, we cover South London and all of Surrey and Berkshire. Call us today on 01932 232790 or 07973 717702 for a free no obligation quotation. We are fully insured. F.A. 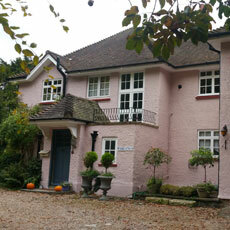 Van Gramberg and Son are a family business established in 1983, painters and decorators, based in Walton on Thames. We are clean, efficient and take pride in our finish. We handle all aspects of residential and commercial work, handling insurance work, schools, to complete houses, to a single bedroom. Our pride comes from the many clients that continue to recommend us. 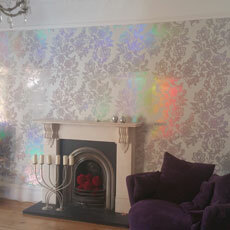 We deal with all aspects of interior and exterior painting and decorating. Quotations are free and highly competitive. Please take time to view our gallery of hand-painted kitchens. Our team of painters and decorators are dedicated to providing our valued customers with a quality, professional and stress-free service. Over the last 25 years, we have built an enviable reputation for ourselves which is based on the personal and professional manner with which we deliver top results. We work throughout Surrey, South London and Berkshire and are more than happy to advise clients on appropriate and suitable products to meet the required application. We don’t cut corners! We will provide you with the best standard of materials and paint to ensure the highest quality of work. At any stage of the project we will recommend and advise you to the best of our knowledge. As highly rated painter and decorators, our success is based on honesty to our clients, quality in the the end result and reliability in the work we deliver. We take pride and care with all our clients’ homes, hotels, schools or whatever the job may be. Working clean is one of the important rules our team follows. 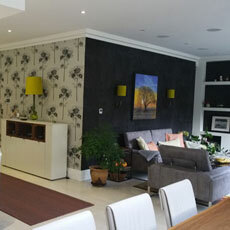 No job is too big or too small for our dedicated team and we specialise in hand-painted kitchens, giving your kitchen a new lease of life, wallpapering to the highest standard and quality, a job that few home owners relish, and the redecoration of the outside of homes, schools and commercial buildings. We have many happy clients in Weybridge, Walton-on-Thames, Cobham, West Molesey and East Molesey and always welcome new enquiries from these areas. We would be very happy to give you a free, no obligation quotation. Repaint your kitchen for a fraction of the cost of a new one. 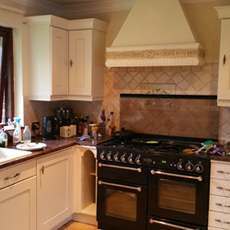 Our speciality is upgrading 10 or 20 year old bespoke oak or pine kitchens. Having your old kitchen hand-painted is very cost-effective and you will be amazed at the result. Wallpaper is back! We hang all types of designer fabrics and papers. Hanging wallpaper is not an easy job, particularly if it is patterned. It is also more expensive than paint if you get it wrong, however our team has the skill and experience to give you a great finish. We offer a comprehensive external redecoration service to spruce up the outside of your home. Our knowledge, skills and expertise mean that we can undertake works of all sizes, types and duration. The right preparation and application will benefit your exterior redecoration project with a longer-lasting finish. Across South London, Surrey and Berkshire we have over the years painted and decorated hundreds of residential properties. Browse through the Gallery to see a few examples.